The capsule stain employs an acidic stain and a basic stain to detect capsule production. 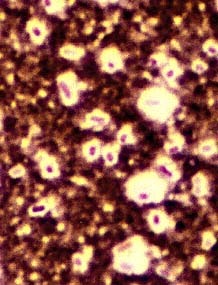 Capsules are formed by organisms such as Klebsiella pneumoniae . Most capsules are composed of polysaccharides, but some are composed of polypeptides. The capsule differs from the slime layer that most bacterial cells produce in that it is a thick, detectable, discrete layer outside the cell wall. Some capsules have well-defined boundaries, and some have fuzzy, trailing edges. Capsules protect bacteria from the phagocytic action of leukocytes and allow pathogens to invade the body. If a pathogen loses its ability to form capsules, it can become avirulent. Bacterial capsules are non-ionic, so neither acidic nor basic stains will adhere to their surfaces. Therefore, the best way to visualize them is to stain the background using an acidic stain and to stain the cell itself using a basic stain. We use India ink and Gram crystal violet. This leaves the capsule as a clear halo surrounding a purple cell in a field of black. The medium in which the culture is grown as well as the temperature at which it is grown and the age of the culture will affect capsule formation.Â Older cultures are more likely to exhibit capsule production. When performing a capsule stain on your unknown, be sure the culture you take your sample from is at least five days old.